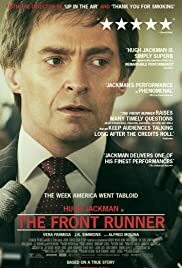 Director: Jason ReitmanWriters: Matt Bai, Jay CarsonStars: Hugh Jackman, Vera Farmiga, J.K. SimmonsSummary: Gary Hart, a U.S. senator from Colorado, is the widely accepted front-runner in the race for the Democratic presidential nomination. After losing the 1984 nomination to vice-president Walter Mondale, Hart decides to run for President of the United States. At one point during his campaign, against the will of his manager Bill Dixon, Hart challenges the press and public to "follow him around" while he's not campaigning on weekends. This proves to be a mistake when in 1987, photos of him and journalist Donna Rice are published by Miami Herald Reporters. In a desperate attempt to clear his name, Hart tries to fix his reputation at a news event concerning the affair but to no avail. Because of the consequences of his actions, Hart is disgraced, berated by Dixon, and forced to drop out of the campaign while his wife Oletha remains to be close with him. Donna also announces that she has personally denied sleeping with the now former senator..